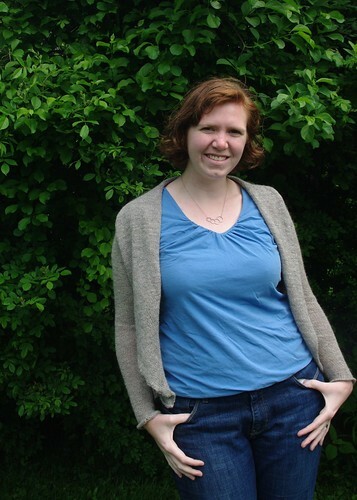 A key thing to know about my progress as a designer is that I learned to sew a long time before I ever learned to knit. As a result, some of my earlier designs were the product of shoehorning knitted fabric into a sewn-like construction (I thinking primarily of Wetherell and the Carmel Clutch here.) Not to say that they didn't work, but that they weren't "knitterly." When I say knitterly, I mean something that takes distinct advantage of what only hand-knitting can do, or what knitting does best. Yes, you can knit a woven-look stitch pattern, but clearly weaving does it better (and easier). Knitting miles of fine gauge stockinette? Perhaps you're better off buying a sweater-knit fabric and sewing it together, or working the pattern on a knitting machine. But shaped-lace? Knitting (or crochet) wins. Cables? Only in knitting. Seamless construction that's not a simple tube? Knitting again. Which brings us to i-cord. If, like me, one of your first introductions to knitting was through a knitting doll/nancy or mushroom, then you know that i-cord or "corking" is quintessentially knitterly. Those tight little tubes of yarn that go on and on and on. 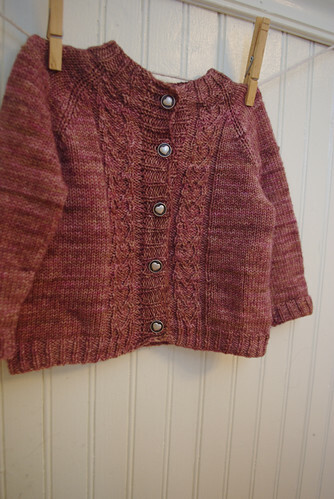 I first ran into i-cord as a garment edging when I knit my still much loved and worn Manu sweater. Having enjoyed it in someone else's designs, I decided to integrated into one of my own, and to see if I could find a way to replicate the effect of i-cord, not just on the edges, but within the fabric itself. Discovering that a horizontal pleat/welt/ridge did the trick nicely, I ended up with the Bob & Wave Cowl. The i-cord/welt combination stuck in the back of my mind and when LMC needed a winter sweater it sprung back to life (in a surprisingly similar color...). 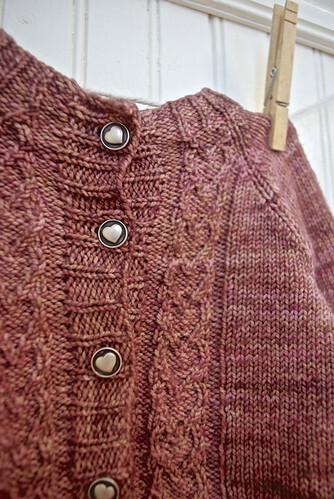 Here the i-cords and welts play up the structure of a circular yoke and give not only a clean finish to the garment edges, but provide some built-in button loops. 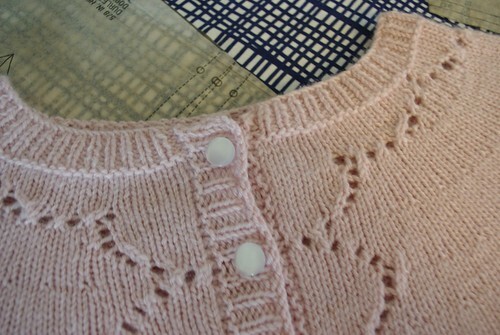 The circular yoke construction is further emphasized by expanding vertical ribs. 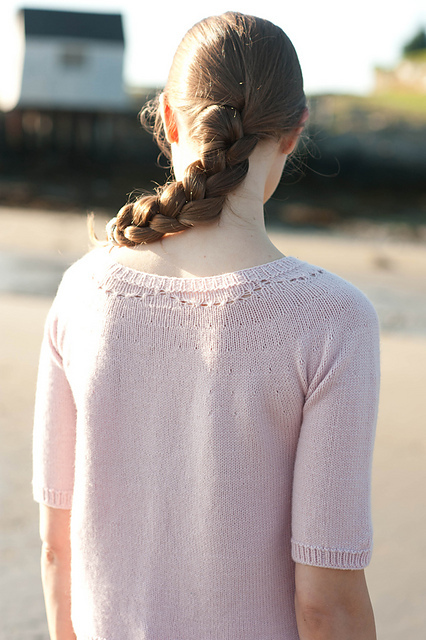 A simple workhorse yarn - here Quince & Co's Lark, places the focus on the texture and structure. The finished garment is nearly seamless (there is some grafting at the back of the hood) and, I would say, very knitterly. Sample size 2T, shown on 22-month old w/ sleeves cuffed. 4 (4, 4, 5, 6, 6, 7, 7, 8, 8) skeins Quince & Co. Lark in Bird’s Egg [100% American Wool]; 134 yds [123 m] per 50g or approximately 415 (455, 495, 555, 695, 735, 845, 930, 990, 1045) yards of worsted weight yarn. 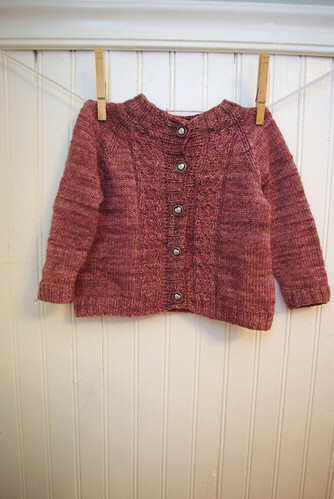 Shortly before the Little Miss was born I picked up two skeins of the Woolen Rabbit's Pearl in woodrose, which eventually became this little cardigan. 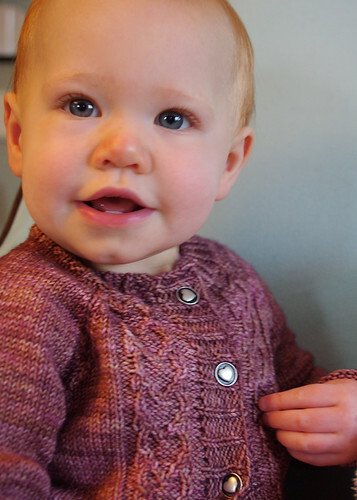 The color and heart cables are sweetly subtle and the simple shape, short repeats, and small size make this a quick knit. You could whip one up before Easter! Available for $6 USD or queue it up on . 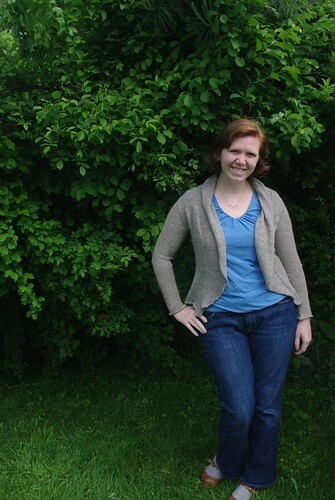 Back in February, I set out to design my idea of the perfect spring sweater and the Sakura cardigan is result. 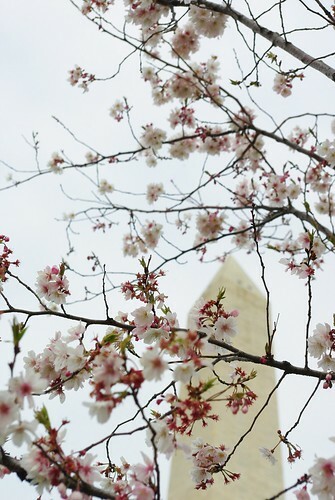 Delicate, airy, and sweetly pink without being saccharine, Sakura was inspired by my visit to the Washington D.C. Cherry Blossom Festival in the spring of 2011. 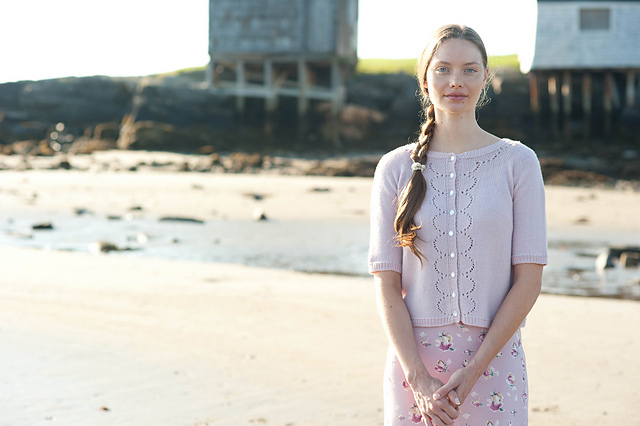 Knit in Quince's springy sport-weight Chickadee yarn, Sakura features elbow-length sleeves, an a-line silhouette and a petal-like lace scallops along the button band and collar. 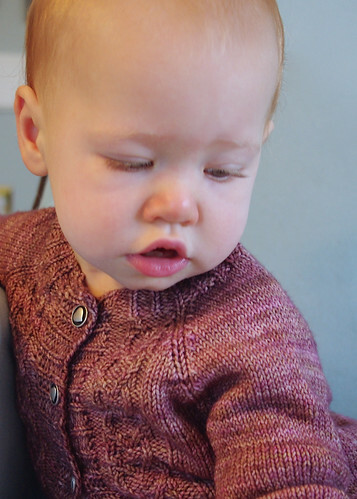 Sakura is knit in one-piece from the top down and utilizes round yoke shaping. 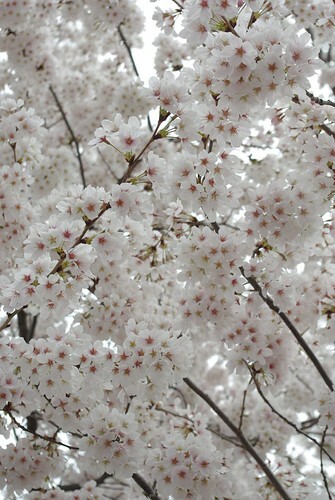 Sakura is written for sizes 31 ½ (33 ¼, 35, 37 ½, 39 ½, 40 ½, 43, 44 ½, 47, 48 ¾, 51, 53 ¼)” and uses 905 - 1810 yards of Quince & Co. Chickadee in Dogwood or another sport-weight yarn. 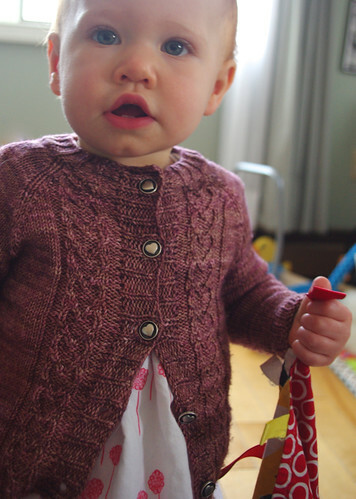 Sakura is available for download on Quince & Co. for $6 USD or you can queue it up on Ravelry. PS – Did you know about my mailing list? You’ll receive notification about all new patterns as well as special discount codes and offers. Sign up Now! All modeled photos © Carrie Bostick Hoge courtesy of Quince & Co. It seems like the sweaters I dislike knitting the most, end up being the sweaters I wear the most. 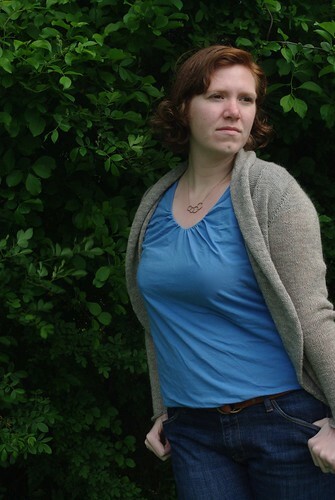 Case in point, That [email protected]#n Sweater, which I wear ALL the time. This sweater falls into the same category. 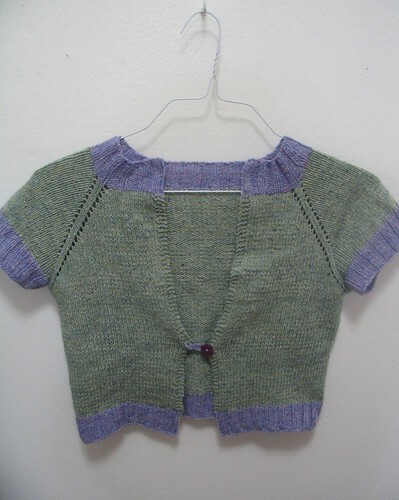 The pattern is Pas de Valse by Marnie MacLean. The pattern itself is fine, but I really lost my knitting mojo working on this thing. I blame too much stockinette stitch on size 6 needles. I knit the size closest to my actual bust size, with about 1 inch of ease. I wish I had gone one size up, but I thought it would grow much much more than it did when blocking (the yarn is alpaca/nylon sock blend from Snowshoe Farms that I picked up at Rhinebeck). I did end up going up a size on the sleeves, which I'm awfully glad I did. The finished product is very wearable - I think I've worn it three times this week already, but in the end, it's just not my favorite. 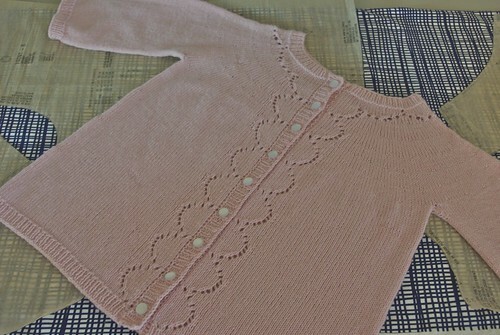 I didn't care for knitting it and I think the style of the finished object, though lovely, just isn't me. I'm not really a drapey-style gal. Of course, I say this, but because the color really fills a need in my wardrobe, I will still wear it a lot.